Search Results for "cold scarf"
Cute Christmas Robin In Snow With Copy Space, Kids Snowman. Cold Winter With Scarf And Hat. Real Time Snowing In Garden. A beautiful woman hiding from the cold behind her warm scarf while walking in slow motion across a wooden desert bridge at sunset. A shy beautiful girl smiling and laughing happily while putting on a warm scarf on a cold autumn desert morning. Beautiful young woman wearing fashion scarf standing in cold winter city street at night, looking at camera, closeup. Slow motion, shallow DOF, 4K UHD. 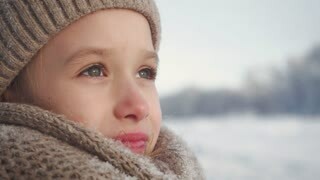 A cute girl walking and smiling with happiness in slow motion across a wooden desert bridge wearing a scarf on a cold autumn day. Portrait of beautiful young blonde woman wearing fashion scarf standing in cold winter city street at night, looking at camera, closeup. Slow motion, shallow DOF, 4K UHD. 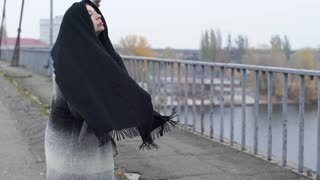 A beautiful girl with long black hair walking along in slow motion and looking at the camera from behind her warm scarf on a cold autumn day. Low angle follow shot of male in hat & scarf walking through sunny cold woodland trees. Dolly shot closeup macro of striped white and grey warm furry fluffy woolen fabric with fringe. Scarf or sweater for winter cold laid on a clothing store or in a tailor's. Dolly shot closeup macro of striped white and grey warm furry fluffy woolen fabric scarf or sweater for winter cold laid on a clothing store or in a tailor's. Dolly shot closeup macro of grey warm woolen fabric scarf or sweater for winter cold laid on a clothing store or in a tailor's.